Money continues to be a problem for me. I was worried to bring too much cash with me, but now that I’m here, I can’t get any. I’ve had to budget my money to make sure I can eat and have enough water. I spent the whole day lounging around and doing nothing. I slept in – a well needed rest after months and months of working. Living in a cashless society has made the beginning of this trip difficult, but as I was riding into Moshi Town with four local guys, I had an interesting conversation with one of them who seemed well educated about history and world politics. In a cash society like Tanzania, you spend what you have and save what you have for unexpected expenses. Himself, for example, explained that because they don’t have insurance, they must save their money incase they get sick and need medical care. I went to the bank and took out money. Probably too much, but I won’t have to worry about that for the rest of the trip. I met some students from an Ottawa University eco program here in Tanzania. They had the best luck on their Serengeti Safari and had animals all over the place. I met my guide Eli (pronounced Elly) who seemed very nice. A girl from Australia will be joining us up the mountain. Her name is Angela and she’s travelling on her own as well. I have to eat well, sleep well, drink lots and polé-polé (slowly, slowly). No problems there! This is going to be quite the experience! Where do I start? I’m sitting here at Maranda Hut, which is, according to my trusty GPS, sitting at 2715m above sea level. 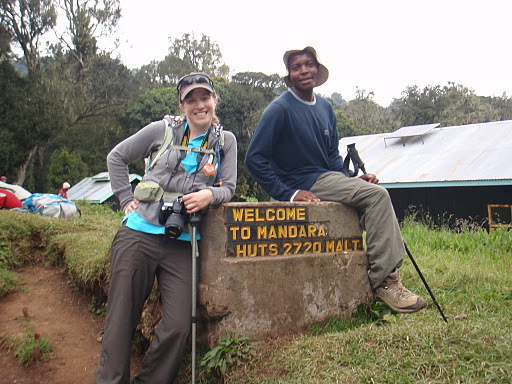 Our total journey from Marangu Gate ascended 831m in 3 hours of walking for a total distance of 10.8km. Our average walking speed – well it says our moving average was 3.7km/h but I think that includes our driving distance. Polé-polé! When we started, I was feeling a little strange: my chest felt tight and I was having trouble breathing. My head ached! We were walking very slowly, almost ridiculously slow, but I wouldn’t have it any other way. Honestly, what’s the rush? 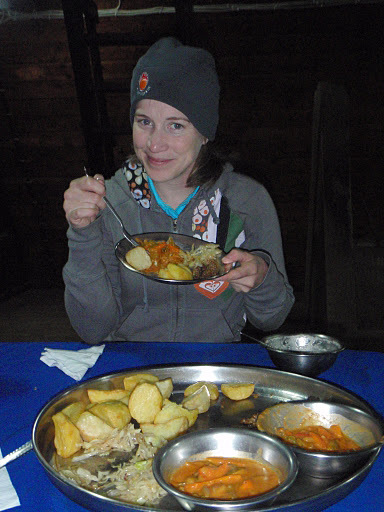 We stopped at a site for lunch along a main road – apparently the porters were cheating! 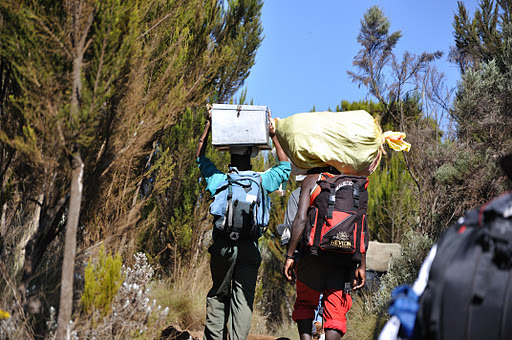 Just kidding – we have one chief guide, 1 assistant guide, one cook, five porters, each porter carrying 20kg. Angela told met hat the porters get paid $7 for the whole trip? I hope that’s not true. I would really like to know who’s benefitting from my $ spent because the trip wasn’t cheap! The food has been delicious and Eli has been a real treat. A positive, smiley man eager to please. Today was really great and I’m very tired but not exhausted. I’m going to sleep well tonight! Today was a longer day, but not too bad. 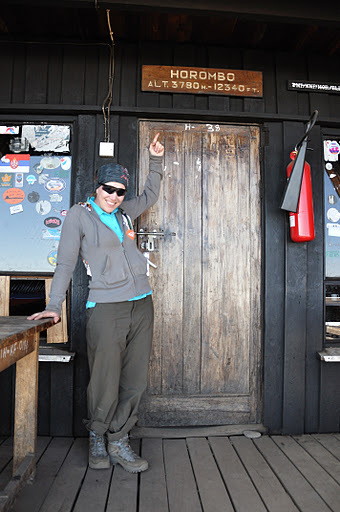 We made it to Horombo Hut, sitting at 3780masl on the edge of the world. We are above the clouds and ascended out of the rainforest and through the moorland. Eli has been the best guide and very patient with us. He is always smiling and laughing. He checked our oxygen and pulse when we reached Horombo: 91 oxygen and 89 pulse. Not bad! He said if oxygen is below 50 and pulse over 150 (?) then they don’t let you continue. So far I am rockin’ but I am nervous. We met a guy at the lunch site from Bermuda who said he didn’t make it to the summit. Now both angela and I are a little scared of how we’ll do. A positive mental attitude, coupled with eat well, sleep well, drink lots, polé-polé, and mine: smile all the time! We learned some slang today “mumbo” means “what’s up” and we respond with “poa kecheezie, kaman deezie”, which means “crazy like a banana!”. Well, poa means ‘cool’ so it would be “I’m cool, crazy like a banana!” Both Angela and I feel pretty good, no headaches or nausea. I think tomorrow will be the real test. I still can’t get over how these guys can carry 30 pounds on their heads without using their arms or hands to keep them in place! It seems as though we’re at the top of the world! The climb today went through the last of the moorland and into the lunar desert of the saddle. We stopped for lunch with some mountain mice, one of which decided to drink Angela’s juice box through the straw. How in the…? 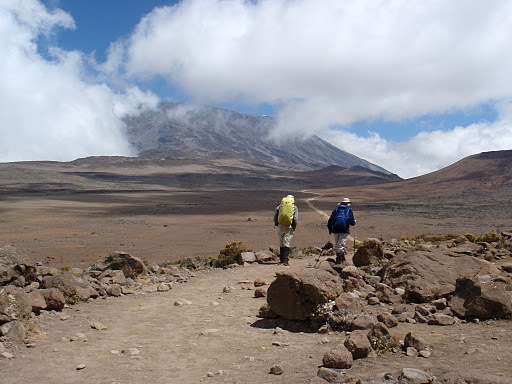 There was a chilling wind as we walked through the clouds to Kibo Hut. I kept looking for Beth or Shingo. 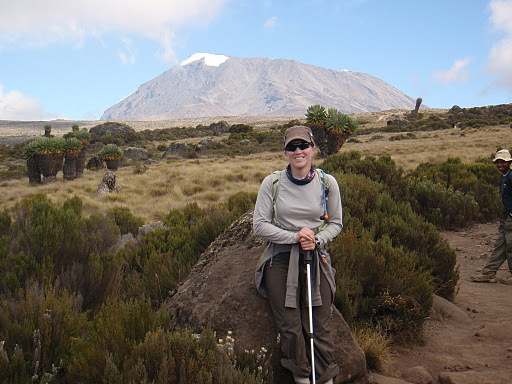 I finally saw Beth as I arrived at Kibo (4700masl) and she was just heading back down. She didn’t make it to the summit; started feeling nauseous at Kibo and tried to climb but couldn’t continue. A lot of others we passed didn’t summit either and Angela and I were starting to get worried about our chances. 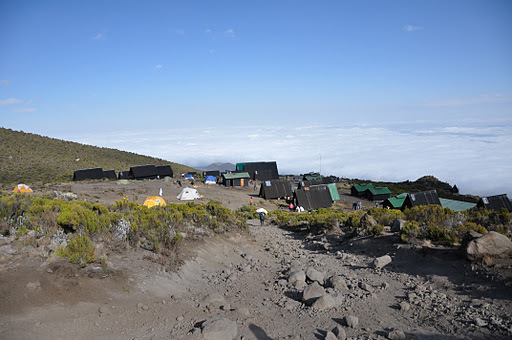 To help with the altitude, after dropping our things off at Kibo, we climbed for a while and hung out above the huts before coming back down. 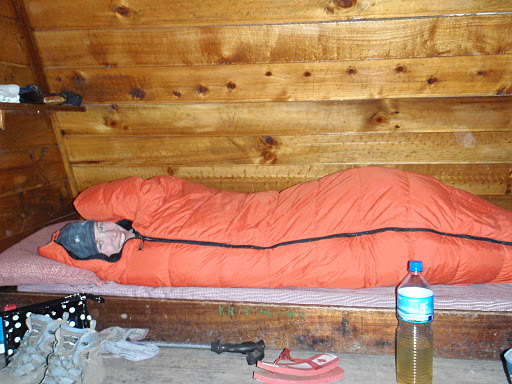 Eli wanted us to start early to get to the top, so we ate and crawled into bed around 1730, to wake at 2300h! For the final push. The long trek ahead. We’re climbing although it doesn’t look it! 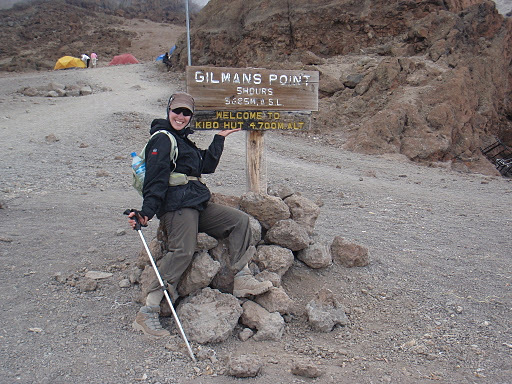 Kibo (4700masl) 5 hours to Gilman’s Point!